Wetlands are one of the most crucial ecosystems for the biodiversity of plants and animals, as well as, the overall health of the surrounding environment. Humans rely heavily on wetlands for protection against coastal storms, water purification, and production of food and water. All across North America, there are various types of wetland habitat. On the east coast, you can find salt marshes that act as buffer zones from the Atlantic Ocean. In the Great Plains of North America lies the prairie pothole region which provides some of the most important wetland nesting habitat for waterfowl. As well as thousands of swamps across the continent which provide vital habitat for waterfowl, mammals, fish, and other non-game birds. The United States Environmental Protection Agency defines a wetland as areas where water covers the soil, or is present either at or near the surface of the soil all year for varying periods of time during the year (epa.gov). Generally, wetlands can be divided into two categories, coastal/tidal and inland/non-tidal. Both of these wetlands provide vital habitat for a variety of aquatic and terrestrial species. Although, over the last century there has been a significant decline in wetland habitat. This habitat loss can be attributed to many different causes, and as a result, the biodiversity of these areas has suffered. Wetlands such as coastal marshes and freshwater swamps provide many benefits to humans. These wetlands are highly productive and diverse ecosystems. They provide many ecosystem services, like water purification, buffering of runoff and river discharge, production of food and fiber, and ecotourism (Reis, Hermoso, Hamilton, Ward, Chouinard, Lehner, Linke, 2017). Although, even with all the benefits wetlands provide, the degradation of these ecosystems continues to rise. The reported long-term loss of natural wetlands averages between 54% and 57%, reaching up to 90% in some regions of the world. This study on wetland degradation shows historical habitat loss including a 69%-75% decline of inland wetlands in the twentieth century (Reis, Hermoso, Hamilton, Ward, Chouinard, Lehner, Linke, 2017). The loss of these vital ecosystems can be much attributed human development and expansion. In an interview with waterfowl ecologist Dr. Michael Schummer of SUNY-ESF we discussed the loss of wetland habitat and what it can potentially mean for the wildlife that live there. Dr. Schummer specifically picked Long Island salt marshes as an example to explain the human impact on wetland degradation. “In the mid-1900’salt marshes on Long Island were dredged in an attempt to decrease the mosquito population (Schummer, 2019).” This resulted in long cuts through wetlands all across the south shore of Long Island. In conclusion, Dr. Schummer stated that “the main cause of wetland loss is due to human development, urbanization, and miss management (Schummer,2019).” With the loss of this habitat, it is only natural the biodiversity of these ecosystems will also feel the effects. “When you lose habitat like that, waterfowl, invertebrates, aquatic species and the wildlife that use these areas will be impacted (Schummer, 2019).” The focus must now shift to preserving what wetlands are left and restoring habitat in suitable areas. In another interview with SUNY-ESF masters candidate/ waterfowl research assistant, Gary Macy touches on the loss of wetland habitat and its effects on biodiversity. Macy also turned to Long Island’s salt marshes as a prime example of wetland loss. “Mosquito dredging led to coastal habitat degradation and it changed the flow mechanics of the wetlands, which alters the habitat and therefore the niche of the species that live there (Macy, 2019).” Restoring these wetlands will not only take a lot of money and time, but also political power as Long Island and New York have many levels of government littered with policies, permits, and regulations. The common theme through both interviews was that human impact and urbanization has been a major cause of wetland loss across North America. With this being said, it is important to engage the public and wetland-dependent communities about conservation and restoration efforts. In 2017, a survey was conducted to gauge the general public’s interest in wetland conservation and restoration efforts. The survey resulted in a 23% response rate of the 5,000 mail surveys that were sent out. The public was aware of wetlands in their community, and many had visited within the last few months. Most common reason for visits were walking, hiking, biking, bird watching and enjoying nature. The respondents listed their concerns about wetland benefits, and they included clean water, clean air, and habitat for wildlife (Wilkins, Miller, 2018). Environmental communicators must develop ways to help strengthen the connection between the public and local wetland ecosystems. There is no one solution to wetland loss, but collective efforts can make a significant impact. Supporting conservation organizations like Ducks Unlimited and Delta Waterfowl are important as they help restore and preserve wetland habitat. At a local level, individuals can make a difference through recreation and use of these wetlands. Showing local government officials that the public values these ecosystems and they need to be protected. The development of wetlands must end if there is hope to restore what has been lost and bring back a flourishing biodiversity. 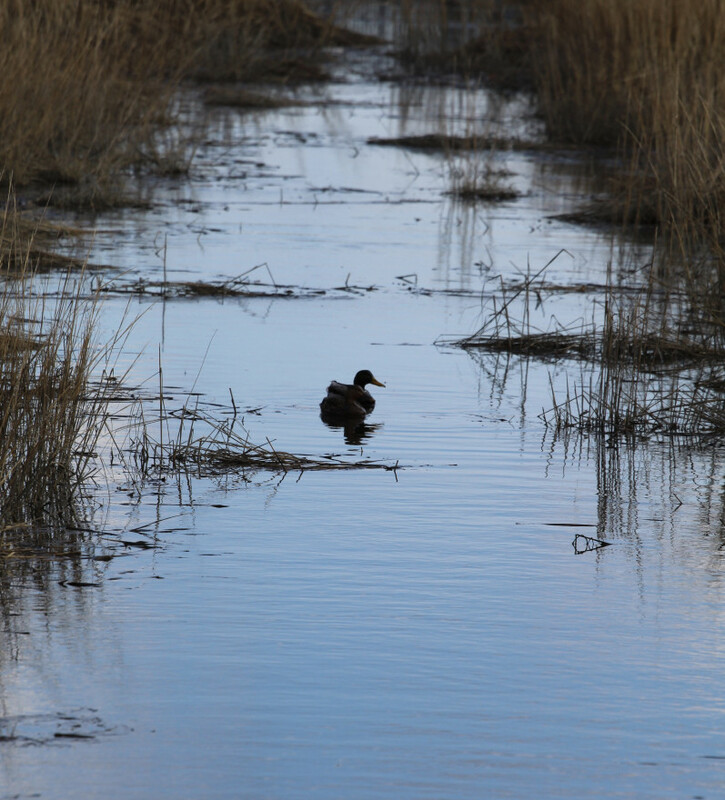 Focusing on coastal wetlands is important to help increase certain populations like the American Black Duck and Atlantic Brant, who use these marshes as wintering habitat. There are many species that rely heavily on specific marsh niches, like a coastal wetland and if that habitat continues to disappear, populations will suffer. As the environmental movement continues to grow and refine its edges, there must be a concentration on wetland habitat. These ecosystems provide life for numerous kinds of aquatic and terrestrial species. The public needs to become more informed and involved in conservation efforts. If you teach someone to love something, they will want to protect it. Macy, G. (2019, February 20). Wetland Habitat Loss and Biodiversity [Personal interview].